References m_eChange, m_lvSuggestions, m_txWrong, and m_wDialog. References AP_UnixDialog_Spell__onAddClicked(), AP_UnixDialog_Spell__onChangeAllClicked(), AP_UnixDialog_Spell__onChangeClicked(), AP_UnixDialog_Spell__onIgnoreAllClicked(), AP_UnixDialog_Spell__onIgnoreClicked(), AP_UnixDialog_Spell__onSuggestionChanged(), AP_UnixDialog_Spell__onSuggestionDblClicked(), AP_UnixDialog_Spell__onSuggestionSelected(), COLUMN_SUGGESTION, XAP_App::getStringSet(), XAP_StringSet::getValueUTF8(), localizeButtonUnderline(), localizeLabelUnderline(), m_eChange, m_highlight, m_listHandlerID, m_lvSuggestions, XAP_Dialog::m_pApp, m_replaceHandlerID, m_txWrong, m_wDialog, newDialogBuilder(), NUM_COLUMNS, and s.
Referenced by onChangeAllClicked(), and onChangeClicked(). References _convertToMB(), COLUMN_NUMBER, COLUMN_SUGGESTION, FREEP, gchar, UT_GenericVector< T >::getItemCount(), UT_GenericVector< T >::getNthItem(), XAP_App::getStringSet(), XAP_StringSet::getValueUTF8(), m_eChange, m_highlight, m_lvSuggestions, XAP_Dialog::m_pApp, AP_Dialog_Spell::m_pWordIterator, m_replaceHandlerID, AP_Dialog_Spell::m_Suggestions, m_txWrong, s, and UT_DEBUGMSG. Referenced by AP_UnixDialog_Spell__onAddClicked(), AP_UnixDialog_Spell__onChangeAllClicked(), AP_UnixDialog_Spell__onChangeClicked(), AP_UnixDialog_Spell__onIgnoreAllClicked(), AP_UnixDialog_Spell__onIgnoreClicked(), and AP_UnixDialog_Spell__onSuggestionDblClicked(). 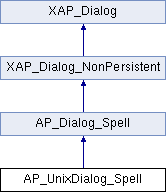 References AP_Dialog_Spell::addToDict(), AP_Dialog_Spell::ignoreWord(), and UT_DEBUGMSG. Event-handler for button "Change All". References _convertFromMB(), AP_Dialog_Spell::addChangeAll(), AP_Dialog_Spell::changeWordWith(), FREEP, m_eChange, UT_DEBUGMSG, and UT_UCS4_strlen(). References _convertFromMB(), AP_Dialog_Spell::changeWordWith(), FREEP, m_eChange, UT_DEBUGMSG, and UT_UCS4_strlen(). Event-handler for button "Ignore All". References AP_Dialog_Spell::addIgnoreAll(), AP_Dialog_Spell::ignoreWord(), and UT_DEBUGMSG. Event-handler for editing the suggestion. References COLUMN_SUGGESTION, gchar, label, m_eChange, m_listHandlerID, m_lvSuggestions, UT_ASSERT, and UT_DEBUGMSG. References COLUMN_SUGGESTION, gchar, UT_GenericVector< T >::getItemCount(), m_eChange, m_lvSuggestions, m_replaceHandlerID, AP_Dialog_Spell::m_Suggestions, UT_ASSERT, and UT_DEBUGMSG. References _constructWindow(), _populateWindowData(), AP_Dialog_Spell::_purgeSuggestions(), _updateWindow(), abiDestroyWidget(), abiRunModalDialog(), abiSetupModalDialog(), AP_Dialog_Spell::m_bCancelled, m_listHandlerID, m_lvSuggestions, m_wDialog, AP_Dialog_Spell::makeWordVisible(), AP_Dialog_Spell::nextMisspelledWord(), onAddClicked(), onChangeAllClicked(), onChangeClicked(), onIgnoreAllClicked(), onIgnoreClicked(), SPELL_RESPONSE_ADD, SPELL_RESPONSE_CHANGE, SPELL_RESPONSE_CHANGE_ALL, SPELL_RESPONSE_IGNORE, SPELL_RESPONSE_IGNORE_ALL, UT_ASSERT, and UT_DEBUGMSG. Referenced by _constructWindow(), _updateWindow(), AP_UnixDialog_Spell(), onChangeAllClicked(), onChangeClicked(), onSuggestionChanged(), and onSuggestionSelected(). Referenced by _constructWindow(), and _updateWindow(). Referenced by _constructWindow(), onSuggestionChanged(), and runModal(). Referenced by _constructWindow(), _updateWindow(), AP_UnixDialog_Spell(), onSuggestionChanged(), onSuggestionSelected(), and runModal(). Referenced by _constructWindow(), _updateWindow(), and onSuggestionSelected(). Referenced by _constructWindow(), _updateWindow(), and AP_UnixDialog_Spell(). Referenced by _constructWindow(), AP_UnixDialog_Spell(), getWindow(), and runModal().